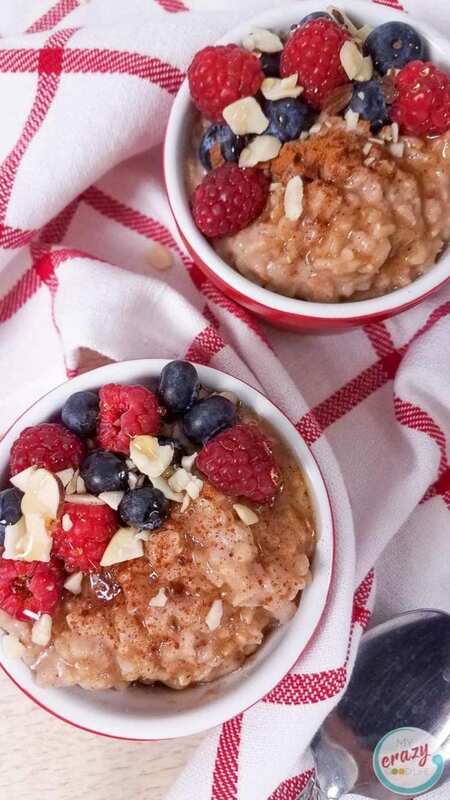 This Healthy Rice Pudding uses almond milk and cinnamon for a hearty and satisfying taste. Make it in a crockpot, the Instant Pot, or on the stove for a delicious and easy breakfast recipe. We all need great recipes like this on hand to help curb cravings and give us a little treat in the form of a healthy alternative. Making the transition to a healthy lifestyle can be tough! We’ve all been there at one point or another, trying to decide if we’re going to stick with it or give up. 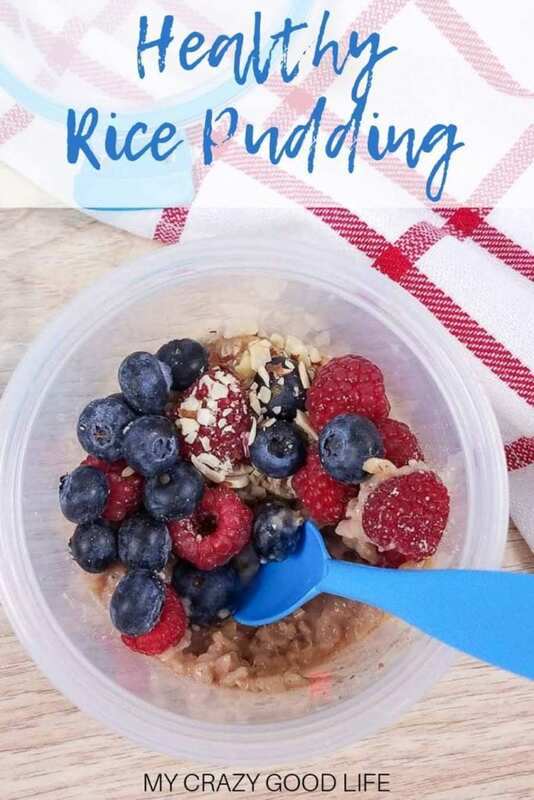 Hopefully this healthy rice pudding recipe will help you stick with your healthy eating plan and reach your goals. You can make this delicious almond milk recipe three ways. It’s an easy brown rice pudding recipe no matter which way you choose, so don’t worry about being in the kitchen all day. 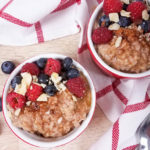 I’ll show you how to make this brown rice pudding in the Instant Pot, Crockpot, and on the stovetop. Mix together all the ingredients for the brown rice pudding in the Instant Pot insert. Close the lid and turn the pressure valve to sealing. Cook the rice pudding on high pressure using the “porridge” setting for 25 minutes (or just set the timer for 25 minutes on manual). Let the pressure release naturally. Remove the lid and mix up the pudding. Serve still warm topped with fresh berries, cinnamon, sliced almonds, a teaspoon of honey if desired. Combine the brown rice with 1 1/2 cup waters in a sauce pan. Bring the rice to a boil, then cover the sauce pan and reduce the heat to low. Allow the rice to cook for 40-45 minutes until the brown rice is tender, stirring occasionally. Remove the lid and stir in the remain brown rice pudding ingredients. Bring the rice pudding to a boil again, then reduce the heat to low and allow the rice pudding to simmer uncovered for another 5-10 minutes until almond milk has reduced and the rice pudding is creamy. 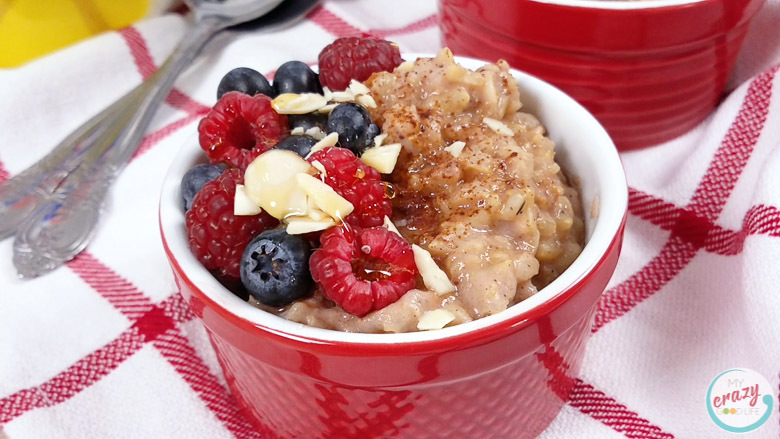 Serve the brown rice pudding still warm topping with fresh berries, cinnamon, sliced almonds, and honey. To make the rice pudding in a slow cooker you will need to increase the almond milk to 2 cups. This is because the liquid will evaporate more in the slow cooker than it will in the Instant Pot. Combine all the brown rice pudding ingredients together in the slow cooker. Remember to use 2 cups almond milk. Cover and cook the rice on high pressure for 2-3 hours. Note: I made the rice pudding unsweetened to allow the pudding to be sweetened to everyone’s taste. You can add a couple teaspoons of natural sweetener to the rice before cooking if desired. Absolutely! 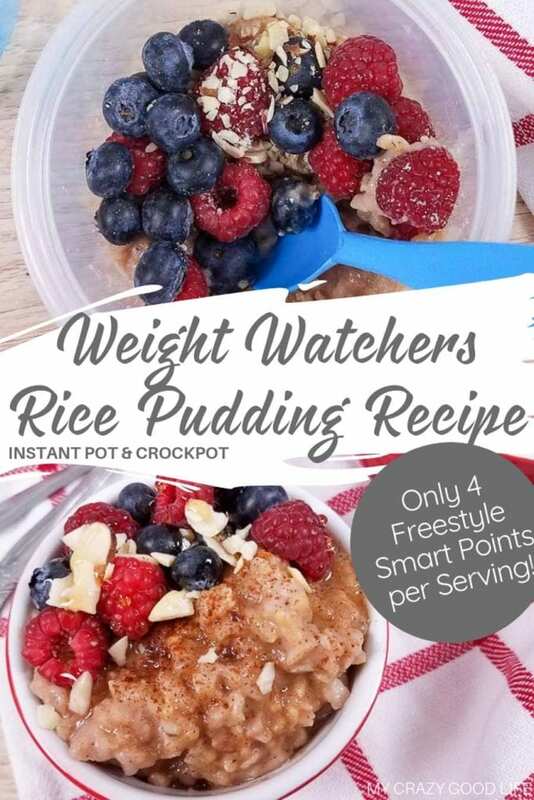 Let’s take a look at the points and containers for this recipe so you can have an idea of just how healthy this brown rice pudding is…you can even eat this on 2B Mindset! Don’t forget to calculate points for any toppings you add! Use this as a breakfast recipe! It’s an excellent healthy choice and you can add your favorite protein side to round out your plate! Is rice pudding healthy for breakfast? Yes! That is one of my favorite ways to enjoy this delicious healthy almond milk recipe. It’s a quick meal prep that I can use all week long for breakfasts or snacks. 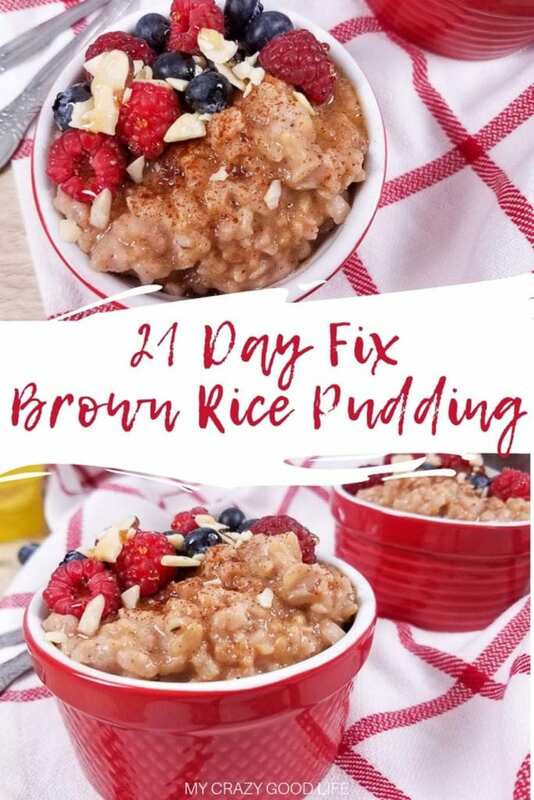 Brown Rice Pudding is a tasty way to curb cravings while still being healthy and within my plan for 21 Day Fix, Portion Fix, 2B Mindset, or Weight Watchers. 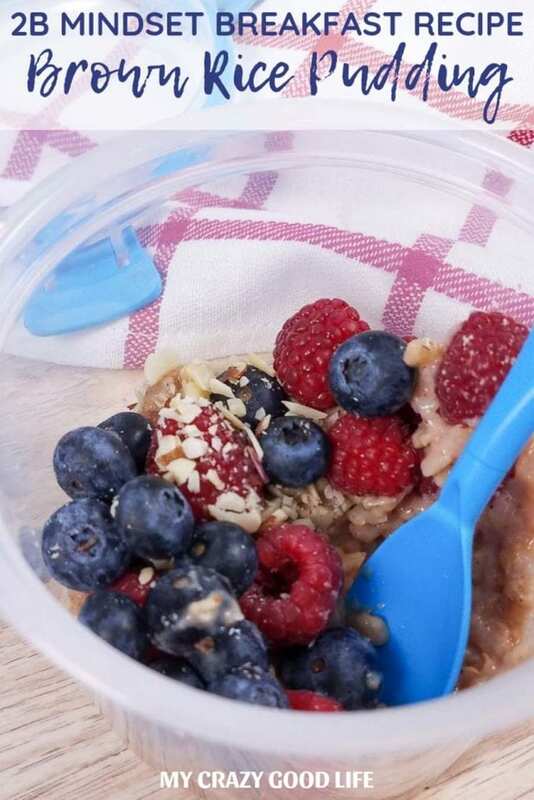 The long grain brown rice is an excellent breakfast choice because it’s slower to digest and won’t give you that sugar spike (and then crash) all while giving you the power to tackle the morning! 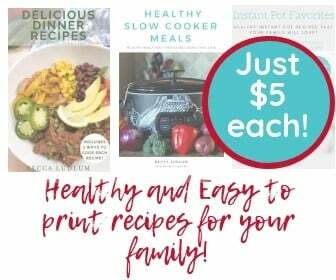 Do you have more healthy recipes I can try? Is rice pudding heart healthy? When thinking about heart healthy choices we have to look at ingredients. 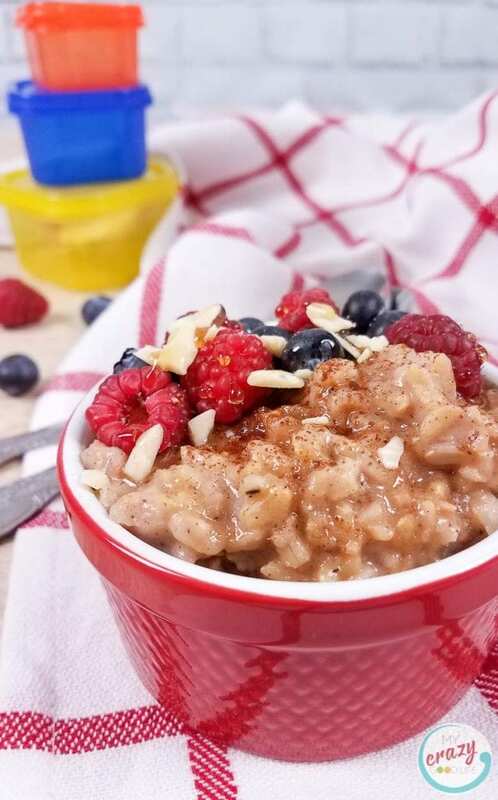 All of the ingredients in this brown rice pudding are better choices when it comes to being heart smart! Whole grains, unsweetened almond milk, and berries are all great healthy options. Good for your heart…and the rest of you as well! Cook the rice pudding on high pressure using the "porridge" setting for 25 minutes. Let the pressure release naturally. Note: I made the rice pudding unsweetened to allow the pudding to be sweetened to everyone's taste or tsp counts. You can add a couple teaspoons of sweetener to the rice before cooking if desired. You would never know this is so healthy, it looks like a decadent dessert! I love brown rice, especially with a smidge of cinnamon. Perfect for breakfast and snack-time. This is a keeper! If I wasn’t on low-carb, I’d be devouring these right now. Love that you added three versions of the rice pudding so I can choose how to make them. Awesome!